AnimeSecrets.org | An Insider’s Look at Japan: Gochisousama deshita! 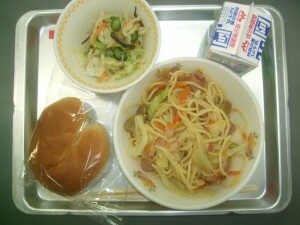 The biggest surprise to me when I began working in Japanese elementary schools was the school lunch. The Japanese elementary school lunch ritual is completely different—and in many ways, I like it better. All three of my schools have six periods, plus recess, cleaning time, and lunchtime. 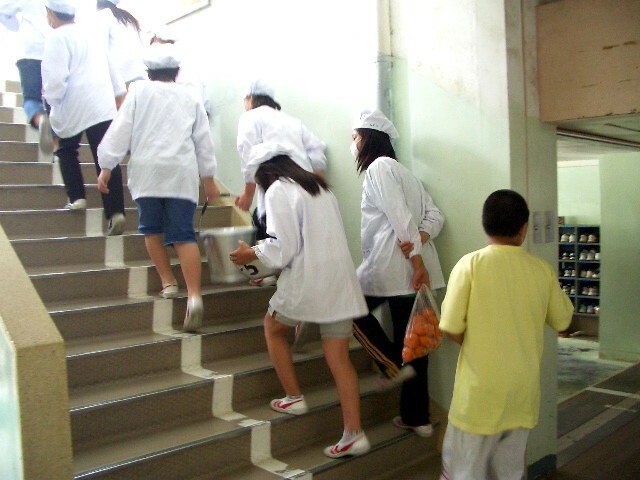 After fourth period, around 12:10, representatives of each class (wearing white fabric ponchos and small surgical masks) go to the school kitchen to fetch lunch for their classmates. The hallways fill with students carrying heavy trays of milk cartons, giant metal pails of soup or noodles, wire baskets filled with dishes and trays, and covered metal pans full of stacked plastic boxes of gohan, or cooked white rice. Younger students are accompanied by their homeroom teachers to prevent accidents. Meanwhile, in the classrooms, students clear off their desks and push them together into assigned lunch groups. 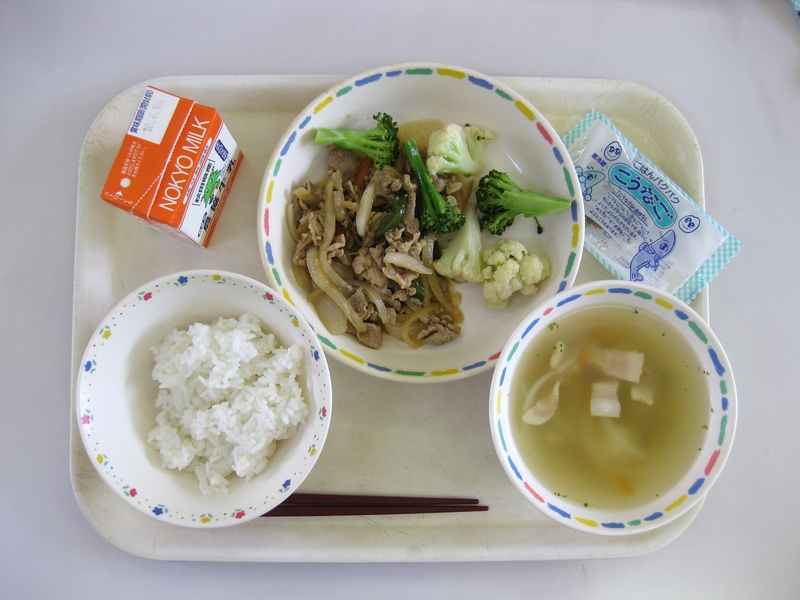 Each student comes to school with a cloth placemat, chopsticks, and a cup and toothbrush for brushing their teeth after the meal. Finally, the students make an impromptu serving counter out of desks and tables at the front of the room. When the food arrives in the classroom, it is set on the serving counter. Depending on the class, students will either wait at their seats to be served by class reps, or form a line to receive their share of the meal. Everyone waits until the food is served, the ponchos and masks are put away, and everyone is seated before they announce and begin the meal. In Japan, one does not just start eating. After the food is served and everyone is at their desk, three or four assigned students stand in front of the class and announce the meal from a menu posted on the wall. They then announce what time the meal will conclude and say the ritual, “Itadakimasu!” Everyone else echoes, “Itadakimasu!” and digs in. School lunches are the same for everyone in the school. As long as you’re paying to eat it, you get the same thing as everyone else. Teachers usually get slightly bigger portions, but that’s the only difference. Also, unless they have a genuine food allergy, students are expected to finish the entire meal—and if a teacher is eating in the room with them, they’re expected to do the same to set a good example. The elementary school lunches I’ve seen almost always include a “salad” part, a soup part, a rice or noodle part, milk, and occasionally, dessert. I say “salad” in quotations because my idea of salad is based on a leafy vegetable, whereas salads at the schools can be any combination of vegetables, as long as they’re predominantly green. Soups, too, come in a variety of ingredient combinations, although usually the formula is “vegetables, mushrooms, and diced meat or tofu in broth.” If there are noodles provided, students will add them to the soup. If there are no noodles that day, there will almost definitely be a small red box of plain white rice. It is the one thing I’ve had to get used to eating in such quantity. On occasion, there will be a meat element to the meal as well. Today, we had what I dubbed “fish nuggets,” and they tasted amazing. There have also been cooked pork slices in sauce, as well as fried fish. Just last week, I had a thin, six-inch long, whole cooked fish on my plate, which my students instructed me to eat starting at the head. It was stuffed with… something. I finished it, it tasted fine, and I didn’t get sick afterwards, which counts as a success when trying new foods in a new country. As stated, lunches sometimes, but not always, come with dessert. What I’ve come across so far are small pastries filled with jam and cheese bits, although fruit can also count. Recently, a slice of watermelon (or suika) appeared on my lunch tray, and it was one of the most delicious examples of its kind I’ve ever tasted. Some of my kids didn’t seem as excited, although most of them ate it, picking seeds out with their chopsticks as they went. Desserts on a school lunch tray are a bit of a bribe, since students (and their role model teachers) are expected to finish everything else they’re given before biting into the sweet. Once finished with lunch, my schools have fifteen or twenty minutes of designated cleaning time. After that, they kids rush outside to flail wildly about the school playground before the bell calls them back in for fifth and sixth period. Firstly, I like that it’s a ritual, and an organized one at that. Granted, there’s still plenty of chaos, as these are children we’re talking about. But much like a choreographed dance, everyone works together toward one outcome, and when the outcome is food, I can’t complain. In addition to the ritual of it, I like how involved the kids are in the preparation of lunch. They carry their own food to their classrooms, distribute it themselves, and take the leftovers and dirty dishes back downstairs at the end of lunch. 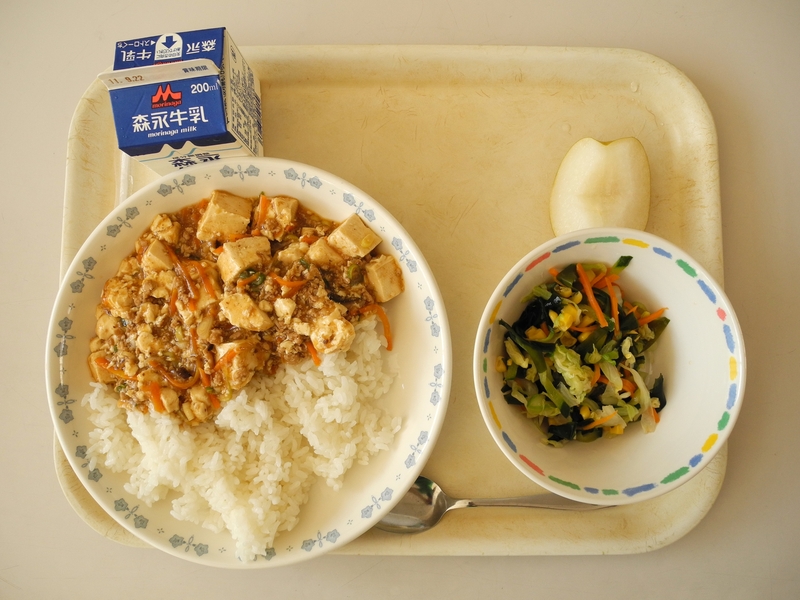 While there are American college students who never learned to do their own laundry, virtually all Japanese elementary students understand that food doesn’t magically appear, nor do the dirty dishes hop away and take care of themselves. Moreover, these kids are being empowered to take charge of meeting their own needs and seeing to the needs of others. Say what you want about the over-emphasized group-mindedness of Japan (because I won’t immediately disagree), but it fosters a tight-knit sense of community that isn’t as present in a diverse, individual-minded country like America. To conclude, school lunches in Japan are different from what I expected upon arriving in this country. They’re far more delicious than I thought they’d be, a lot more healthy, and most of all, much more normal than the elaborate bento-parade I’d been lead to believe I’d see thanks to anime. Maybe there are moms out there who pack Mona-Lisa bento every morning, but these kids’ moms seem happy to let the school feed their kids, and rightly so. From what I’ve seen, Japan believes its kids are the future, and they’re making sure these little munchkins are well-fed.